Are you a fan of The Great American Baking Show? Recently, ABC pulled season three from its holiday lineup because of sexual misconduct allegations against judge Johnny Iuzzini. What do you think? Should the series be cancelled or not? 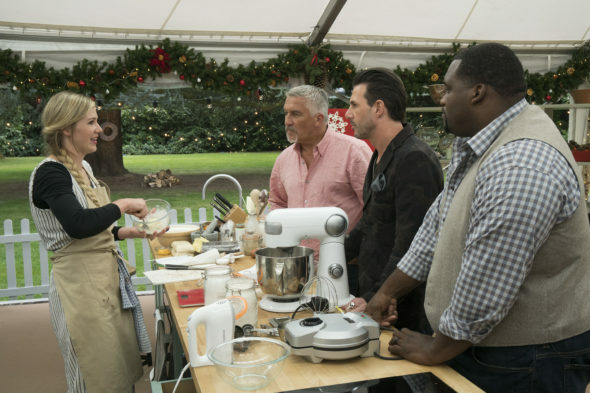 Based on The Great British Bake Off, the cooking competition series pits amateur bakers against each other in a series of food-related challenges. Season three was to feature new hosts Ayesha Curry and Anthony ‘Spice’ Adams alongside judges Paul Hollywood and Iuzzini. After knowledge of Iuzzini’s alleged sexual harassment and abuse became public, ABC terminated their relationship with the chef and consequently pulled season three of The Great American Baking Show prior to airing episodes three and four. Do you think the show should be cancelled completely or should ABC find a new judge and film another season? Do you think the network should air the rest of season three? Tell us what you think. Find another judge and keep it going. I miss the British version but I’d like to see more of the American version as well. The British version of this show is infinitely better. I do not feel it is fair to the contestants. They didn’t do anything wrong. Maybe making Johnny forfeit his pay would be more appropriate. love this show and was so happy when the new season started now disappointed that its cancelled. there must be a judge they can find to work with Mr. Hollywood. Love love love this show!!! I look forward to watching it on Thursday nights!!! Should not have been cancelled!!! Please put the show back on !!! ABC shame on thee!!! Go ahead and play season 3 AND renew it and get a different judge. Where is Mary? Come on, ABC! Show us more episodes, please. Think about renewing The Great American Baking Show for a fourth season. Just move it from the winter season to the fall season. Save the winter season for a Christmas special. Let’s see the rest of the episodes of season three. I think all episodes were filmed before Johnny Iuzzini was arrested. Let’s hope season three will be Iuzzini’s final season. ABC really needs to find a new judge for season four. Arrest? No one was arrested. Didnt read the article I see….. Since the accusations are, at this time, allegations, the show should be shown. It’s very cruel to play a two hour episode and then just shut it down. I want to see the whole show – it was good before but it got better with the addition of Paul Hollywood. I was looking forward to a very interesting season…please let us see it. Allegations are becoming a death sentence to show and actors. The network seems to overreact. Don’t stop showing the new episodes. You are punishing the viewing public. Put a disclaimer in at the beginning and go on with the show. ABC will end up with no shows on air if they take everything off because of an accusation. We will understand that ABC has taken the necessary actions and be done with it. Please bring back The Great American Baking Show!!! I really love it & look forward to it every December. I too, prefer the original hosts. Find new judges, it shouldn’t be that hard. Please ABC, bring it back!!!!! !